I love how your great line work just draws the attention to those big beautiful eyes. Great drawing! 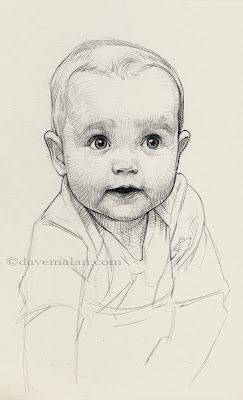 It amazes me how darling you draw the children even with all those lines! I love how the lines are so directional too, they go so well with the playfulness of the child's expression! It's a good exercise, considering they can't stand still for more than one second. Wow, that looks so good. He is so adorable. erik, yes photos are the only way to go with these little kids, unless their sleeping. I probably like to draw my kids because I know their look and personality and feel like I know what I am trying to capture. I can't say how much I love your drawings and your children are beautiful little inspirations. My son's middle name is Wyeth also! Nicholas Wyeth! My Wyeth of choice was N.C. Good call - great name! Aaah yes I should specify, N.C. was definitely the reference for us as well.